It’s 1984, and I am a spotty fourteen-year-old obsessed by Mathew Smith’s latest bizarre creation – Jet Set Willy. Jet Set Willy is the sequel to Manic Miner, at that point one of the most popular ZX Spectrum titles to date – and amazingly it’s a quantum leap ahead of its predecessor. There are something like 60 levels in the game, all of which can be explored in a nonlinear manner. It’s surreal, atmospheric, and feels absolutely vast. But – there’s a problem. The original release of the game is impossible to complete due to a number of bugs. One room in particular – The Banyan Tree – has what’s obviously supposed to be an exit blocked by an impassable block. My brother and I have some limited experience tinkering around with ZX Spectrum machine code so I make a fateful decision – if you can’t beat the game fairly, hack it! Fortunately you don’t need to be Mathew Broderick in ‘War Games‘ to figure out the Jet Set Willy level format and even a certified numpty such as myself can manage it. I start by writing a BASIC program to PEEK at every address in RAM and print out the associated ASCII character (we’d done something similar in an unsuccessful attempt to win £25k for completing Domark’s text-based adventure ‘Eureka‘*). Scanning through the memory it becomes clear where the level data is stored as you can read the names of the various rooms. From there it’s a matter of POKE-ing randomly in the nearby memory space – then launching the game, seeing how the level has changed, and trying to figure out what exactly you’ve just done. Wait five minutes for the game to reload from cassette tape, rinse and repeat. I can’t remember exactly how the level data was formatted but it was pretty straightforward. Each byte (I think) described four ‘blocks’ (two bits for each), with each block being either solid, passable, deadly or empty. After this was a bunch of data containing the graphics for the various blocks, the level name, and parameters describing how the enemies moved. Once I’d figured this out the excitement of designing my own levels quickly overtook the desire to complete the original game – I forgot about The Banyan Tree and wrote a level editor in BASIC aiming to somehow publish my own version. That project eventually became ‘Subterranean Nightmare‘ – an unashamed Jet Set Willy rip-off that was published by US Gold / Americana Software in 1986. 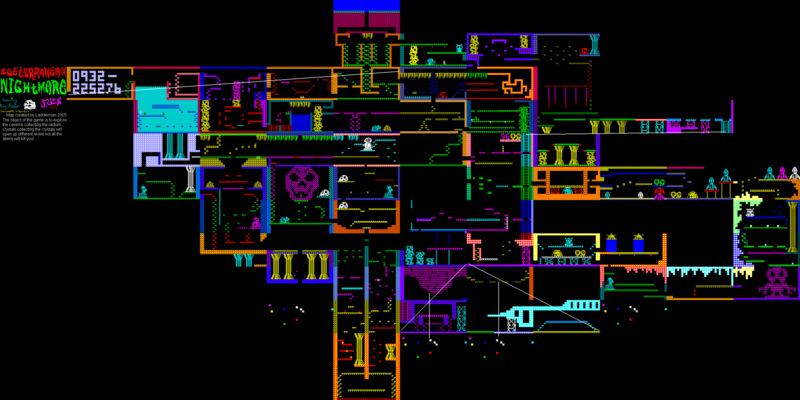 It was written from the ground up but used pretty-much the same level format as Jet Set Willy with a few additions. It contained a few bugs, a lot of bad puns, half-decent graphics and terrible sound. Critical reception was mixed and I received the princely sum of £6,000.00 for it which was a fortune back then and still a significant chunk of change now (if I made that from Toss The Floppy Frog I’d be well chuffed). From then on, barring a brief flirtation with graphic design and digital marketing in the 90s, it’s been game dev all the way. There were a couple of (at the time) innovative features in Subterranean Nightmare which I’m still pleased with in retrospect. Firstly, you could save your progress to cassette tape (a feature I’d never seen on any arcade/platform type game at the time), and secondly there were a series of barriers which blocked further progress until a percentage of the game had been completed. It seems ridiculous now but games at that time were usually either completely open (like Jet Set Willy) or completely linear (like Manic Miner) – I wasn’t aware of any title that utilised this combined approach. One supposedly ‘original’ (i.e. not completely lifted from Jet Set Willy) feature that a few reviews picked up on was the fact that you can jump on some of the enemy’s heads in order to catch a lift to higher platforms. I’m ashamed (ok, not that ashamed) to say that this was actually a particularly pernicious bug that I couldn’t be bothered to fix – deeming it much easier to write it in as a ‘feature’ instead. Looking on the map you’ll see a level that contains a bunch of large numbers. This was my home phone number at the time and was only supposed to be accessible after completing the entire game. Unfortunately a combination of two bugs made that room just about accessible form the first screen (with some fiddling about) so my parents were inundated with phone calls from geeky kids thinking they’d won some kind of prize. Most of the calls were from Scotland for some reason. I can’t believe someone actually did this! You can read about the next Spectrum game I created, ‘Skateboard Joust’, here. * The £25k Eureka prize was eventually won, legitimately, by Mathew Woodley – a kid in my year at school.